The Bowen’s house of horrors is a minefield of scares. Evil dolls, clowns, toys and even the gnarled old tree outside. And of course, closets that contain more than just clothes and shoes. Interesting modern touches, such as an innovative use for a drone and a rogue smartphone are added but the pace is just too breezy and more time could have been invested in balancing tension buildup with the jump scares, measure for measure. From another perspective, as a result of the film’s pace, it also doesn’t drag. And the special effects finale scene in the demonic dimension, are suitably creepy. Although this could have been gourmet, it is actually fast-food horror that’s perfectly passable. The only differentiating factor in the remake is that it veers away from the original in the third act, but by that time the film has already betrayed its audiences. There’s no escaping that you’re watching something you’ve seen a dozen times before. If only there was a dimension of ghosts who terrorize filmmakers who rely on clichés to entertain his audiences. It’s hard to imagine why any parent in their right mind, would fill their teen son’s room with so many clowns. That’s such a horror movie cliche, I feel like using one here to just describe it. These days, I go to horror films for the laughs. I had a tummyache after watching this one. Just too difficult to digest how this film actually got made! 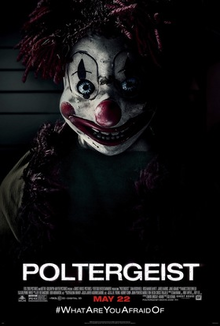 Synopsis: Poltergeist is a 2015 American 3D supernatural horror film directed by Gil Kenan, written by David Lindsay-Abaire and produced by Sam Raimi. The film stars Sam Rockwell, Rosemarie DeWitt, Jared Harris, and Jane Adams.